Small business taxes, how to reduce them, especially in your Child Care. Quick Start For Your Small Business Taxes. Your time spent learning about small business taxes and deductions for your Child Care Business could save you a lot of money. I have created a great list to try and help you be prepared for taking advantage of saving some small business tax tips. Purchase a receipt book that has makes duplicates. When you receive payments from your daycare parents, give them a receipt and you have the copy for your year end total. You'll want to plan your daycare accounting methods because your records MUST be thorough. My husband devised a program for me on our computer with an Excel spread sheet that will total all of my expenses as well as my child care payments from parents. This could be an option for you if you are familiar with that program (or know someone that is) or you could purchase tax preparation software. Another choice is to do your accounting by hand. 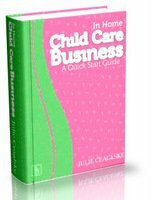 If you like the hands on approach to book keeping, this is an excellent choice for you. It is more time consuming but gets the job done. Our main page on Tax Deductions has one of the best tax tips we ever used in our business. Be sure to check this out...is saved us thousands of dollars over the years. Deductions you may be able to use in small business taxes! These are just a few to start you on your way. Remember...these are possible deductions. Starting a Small Business This site has a great page that will guide you on starting a small business. It has the basics to make sure that you achieve your expected success. You remember our friend Shirley R Wrong? She does not document any of her deductions. She spends thousands every year on supplies and toys and doesn't write any of it down!!!! Last year she made $143,000 (she watches 32 kids) and paid $142,992 in taxes!